Scott Davis blew through batters late in this June 1990 game for short-season Eugene. He went three innings, picked up the win and retired six of the last seven batters of the game, The Eugene Register-Guard wrote. "I broke three bats," Davis proudly told The Register-Guard. "This was my first pro performance with this crowd, I was pumped." Davis pitched well that night, but he encountered difficulty the rest of that season. He ended the year with an ERA north of 7. That season marked his only season as a pro. Davis' career began and ended that year, taken by the Royals in the 33rd round of the draft out of Adelphi University in Garden City, NY. Davis pitched at Adelphi from 1987 to 1990. He remains in the school's record books. He recorded 142 strikeouts over his career, good for seventh all-time at the school. His 14 complete games are fourth all-time and his 182.2 innings are eighth all-time. 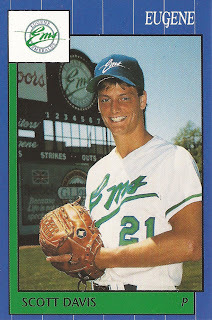 With the Royals, Davis spent the summer of 1990 at Eugene. He got into 17 games in relief. He gave up 22 earned runs in 28 innings of work for a 7.07 ERA. He picked up three wins to two losses to mark the extent of his career. Davis has since settled in North Carolina, where he works in 2018 in wealth management at Davis Williams Wealth Management. "I focus on helping people," Davis says in a quote in his firm bio. "I help them understand their goals, opportunities, risks and the many options available to them."